Born in 1925 in Havre, Montana, Judge Rhoades served as a pilot in the U.S. Navy from 1943 to 1946 and in the Naval Reserve until 1966. 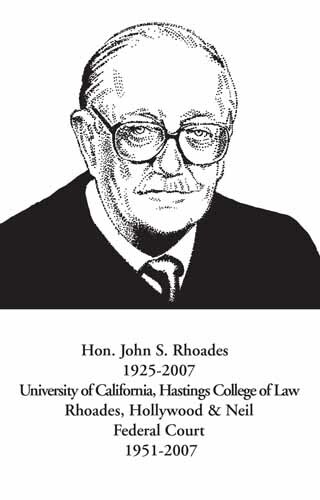 Judge Rhoades received his bachelor’s degree in 1948 from Stanford University, and his law degree in 1951 from the University of California Hastings College of Law in San Francisco. He worked in the San Diego City Attorney’s office from 1952 to 1957, and spent the next 28 years in private practice, first as a sole practioner and then with the firm of Rhoades Hollywood & Neil, before then-President Ronald Reagan appointed him to the federal bench in 1985. Judge Rhoades was known for his wry sense of humor and devotion to the law. He loved the law as an institution and thought very strongly about preserving it and being faithful to it. At the same time, Rhoades was in independent thinker who won the respect of both the defense and prosecution for his evenhandedness. He was a workhorse who would help the court system in any way he could, from working on the preservation of the historic Jacob Weinberger U.S. Courthouse to sitting twice a year on the 9th Circuit Court of Appeals. A many of many interests, Judge Rhoades was an avid reader and fluent in Spanish, which assisted him in the charity work, he performed in Mexico – a country for which he had a profound love. Married for more than 50 years before his wife’s death and the father of five grown sons, Judge Rhoades had a “very strong family” and for many years opened his home to U.S. servicemen for Thanksgiving and Christmas dinners.